English Summary/英文概要： "Barry’s work stands alongside those of Howard and Wawro for anyone with a serious interest in the Franco-Prussian War..." NY Military Affairs Symposium Review In the first part of this comprehensive all-new two-volume military history of the Franco-Prussian War, Quintin Barry presents a detailed account of the war against the French Imperial Army waged by the armies of the German Confederation, directed by that supreme military mind, Helmuth von Moltke. 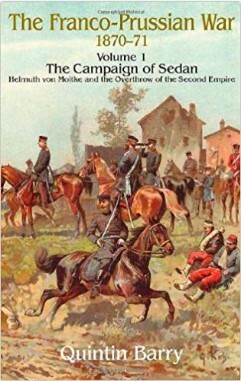 The author places Moltke and his strategic planning in the context of the European balance of power following the ending of the Austria Prussian War of 1866, before exploring the initial mobilisation and deployment of the armies in 1870. All of the battles of this opening round of the war are described in detail, including Weissenburg, Worth, Spicheren, Borny-Colombey, Mars la Tour, Gravelotte, Beaumont and, of course, Sedan. The book ends as the Second Empire of Napoleon III lies defeated, crushed by the German armies directed by von Moltke. The author has made full use of an extensive number of German and French language sources. His detailed text is accompanied by a number of black and white illustrations and battle maps. Orders of battle are also provided. About the Author Quintin Barry is married and lives in Sussex. He is a solicitor, specialising in employment law. Throughout his professional career he has maintained his lifelong interest in military and naval history. He has made a special study of the period from 1848 to 1871, with particular reference to the Wars of German Unification.